ATSPEED Racing are one of the UKs leading Rolling Road Tuning Centres, based in Rayleigh, Essex, England. Here at ATSPEED Racing we pride ourselves on getting the finest calibration out of our customer's cars, and are well respected and known within the industry for the high standard we produce, whether its road, race, or classic. 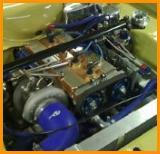 Recommended tuners of Carburettors and mappable fuel injection systems by the manufacturers themselves. Historic and Vintage car tuning is also a speciality. Mechanically sympathetic personnel, who understand the fragility of historic machinery, but apply modern technology to ensure the optimum calibration. Our 1000BHP Rolling Road and Dyno cell is one of the best equipped in the country, allowing accurate, computer controlled testing and calibration for almost all two wheel drive cars, up to over 1000BHP, using world leading technology. 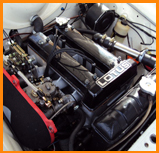 No expense spared on any of our equipment and over 40 years experience in motorsport developments ensures the ultimate possible performance from your vehicle, Road, Race, Rally & Historic.